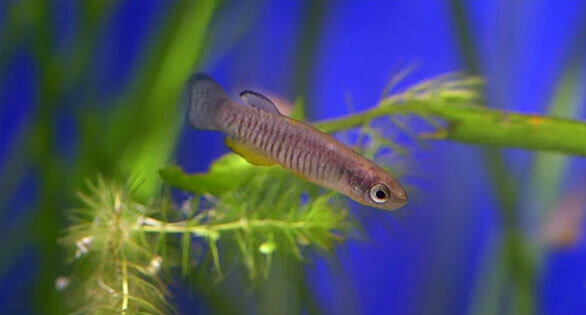 A male of the critically endangered Corfu Killifish, Valencia letourneuxi. Image capture from ZSL footage. In the forthcoming September/October 2016 issue of AMAZONAS Magazine, we introduce our readers to the plight of the Bermuda Killifish (Fundulus bermudae) and the Lower’s Lake Killifish (F. relictus), both Bermudian endemics, and both considered highly endangered in Bermuda. In “Killifishes from Bermuda,” Lamboj, et. al., report, “Because of the dense population and water use, the quality of [these killifishes’] habitat is being degraded and the number of fishes in the pods continues to decline. A turnaround seems unlikely, at least in the near future.” Still, there is hope, but we won’t spoil the article for you. The story of these Bermudian Killies brought to mind the work of experts at the Zoological Society of London (ZSL) dealing with a similar situation in Greece. There, it is the Corfu Killifish, Valencia letourneuxi, which is a critically-endangered freshwater subtropical killifish species. It is native to western Greece. “Lowland springs in the Mediterranean basin [like the Corfu Killifish habitat shown here] are increasingly under threat because of human use,” reports Brian Zimmerman. Image capture from ZSL footage. “Zoological Society of London (ZSL) has been working for the last 10 years with the Hellenic Centre for Marine Research (HCMR), the Institute of Marine Biological Resources and Inland Waters (IMBRIW), developing a conservation management plan for the Corfu Killifish,” says Brian Zimmerman, Aquarium Curator at the ZSL London Zoo. Read more about the endangered Killifishes from Bermuda in the September/October 2016 issue of AMAZONAS Magazine, Magical! MEDAKA. Click the cover below to order this issue. Intentionally Extinct by Hans-Georg Evers, illuminates the ability of species to be lost at a moment’s notice, particularly when governments turn a blind eye. 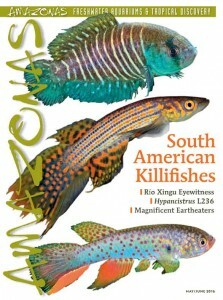 Learn more in the May/June 2016 issue of AMAZONAS Magazine, SOUTH AMERICAN KILLIFISHES. Click the cover below to order this issue. 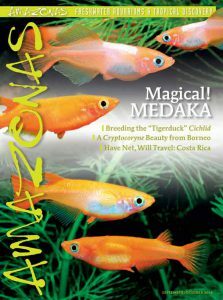 Learn more about a convenient and personal subscription to AMAZONAS, the world’s premier freshwater aquarium magazine.